You know that you want to enhance your yard. However, you have no idea where to start. You can try to tackle it on your own. However, what may end up happening is that you put so much effort into the revamped area that you neglect the rest of the yard. That can make it feel like you’re back to square one. 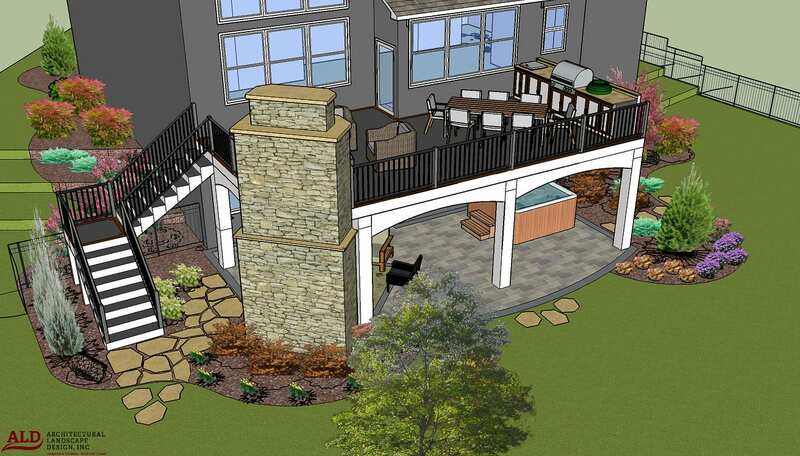 A landscape design and build contractor can help you envision the process from start to finish. Designing the space as a whole creates a unified result. Are there any areas in your backyard that you don’t really visit anymore? Maybe that overgrown garden really needs to be weeded. Perhaps you built a hammock stand but rarely pull out the hammock. Without effective flow, a backyard can feel like a wasteland. This is your property. Wouldn’t it be nice if you could take advantage of every inch? A landscape designer and builder can help you gain a new perspective. Professionals understand how to make the best use of every space, whether you want to use it for meditating, gathering or playing. Your investment will be worth it because you’ll be addressing every square foot of your property. Many homeowners aren’t aware of the building codes that govern construction and landscape design in their areas. Professional landscape designers and builders do. Turning to the professionals can help you prevent putting in a lot of money for materials only to be told that you can’t make your dreams come true. We’ll help you understand any constraints and work within them. Aesthetic guidelines maximize the beauty and usefulness of any space. One of these, according to Garden Design Magazine, is the law of significant enclosure. This rule specifies that the vertical edge of a space should be at least a third the measurement of the horizontal space. This helps you feel safe and enclosed. Knowing this creates instant boundaries and takes a lot of the guesswork out of designing a landscape. Professionals understand how to create a cohesive flow by following a regulating line. This requires extending an imaginary line from an existing structure to generate additional design features. You’ve probably heard about the Golden Rectangle. It’s a ratio that has been observed in thousands of natural elements and is believed to create the most harmonious aesthetics. Another unofficial rule is to go bigger when you’re not sure about the size or scale. Over the years, a huge pool or tall arbor will end up looking just right. If you make it too small, there may always be something that bothers you about it. If you haven’t heard of these landscaping rules, don’t worry. That’s why you hire professionals to take care of your landscape design and build instead of doing it yourself. When you’re working with several different professionals on one project, you’re likely to pay more. Hiring a landscape architect separately from the builders opens the door for miscommunication. It can also cause delays. Using one company to take care of the project helps streamline the process. What does that mean for you? Lower costs and less risk. There is clear accountability. You know exactly who to turn to when you need help. There’s only one point of contact. Scheduling is easier when you’re working in a design-build capacity. Because the professionals can typically take action more quickly, they have access to better real-time plant selection. Choosing the right professional for the job can be challenging. It’s important to seek out information that can help you make a sound decision. Get a detailed estimate from any landscape designer. The estimate should be written and clearly specify what the costs are for. Get a comprehensive explanation of the installation process. You don’t want to stumble upon surprises because you didn’t know that you wouldn’t be able to use your front door for a month. Get a written service guarantee. A written service guarantee holds the professional accountable and gives you peace of mind. A professional that takes the time to get to know you and your space may come up with a more useful plan for your needs. If you have any questions, make sure to ask them before handing over any money. Something as simple as grading your property may not be an obvious DIY project. Professional landscapers understand the ins and outs of every project and can save you time and money. Even if you’re planning to install landscaping yourself, it’s a good idea to consult with a professional first. High-quality landscaping and carpentry will add value to your property. Doing the job yourself may not yield such great results.